Hey! More Lucy Knisley comics - this time Displacement which is about going on a cruise with her grandparents. It's pretty cute. I loved the Bryan Lee O'Malley graphic novel Seconds - all about having another go round at life events so you can change them by eating magic mushrooms. Skim was another graphic novel that was totally fun and also about witchcraft. The new Harper Lee was pretty big news huh? I enjoyed it, but found it more of an interesting addition to To Kill a Mockingbird, rather than a great book in its own right. Among Others by Jo Walton was a re-read for me as we were reading it for book group. I really love this book - it's kinda fantasy, but only slightly... It's also about the power of reading. It's really wonderful. The Sally Mann book called Hold Still is great - it's a memoir about her life as a photographer (you may remember her photos from the 90s of her kids? There was a bit of a hoo-ha around them as her kids were naked for many of them) and it's beautifully written all about love, life, family, art (Cy Twombly appears in it) all wrapped up in a touch of southern gothic, a great read even if you've never heard of her. And These Broken Stars was a teen sci-fi novel which I was totally captivated by! Set in space! And then a strange planet! Wah! 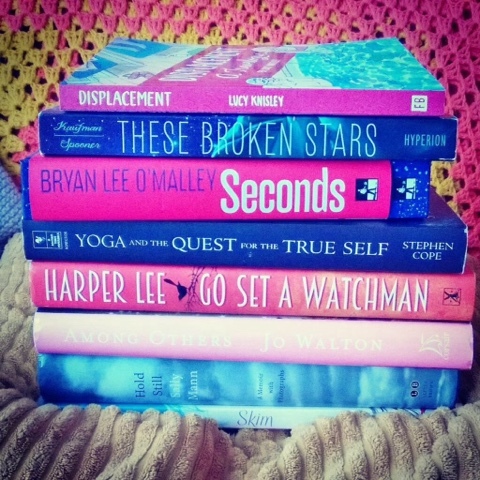 You read any of these? I found this recipe for coconut balls on line - and there are a few different versions (here's one) so have a little hunt! Anyway, these are super easy to make and are relatively healthy! I'm interested in trying out different chocolate for the covering - I just used a good quality dark chocolate, but maybe some kind of raw chocolate would be good. I made these to take for yoga class and then made another two batches for bert to snack on with his friend Lucy while they had a Beverly Hills 90210 night. blend (in a blender) a cup of desiccated coconut with 3 tablespoons of coconut oil and 3 tablespoons of maple syrup and 1/2 teaspoon of vanilla extract. once blended form into little balls and place on a tray covered with parchment paper. then melt the chocolate - the recipe i've linked to above says a cup and a half of chocolate chips, but I fancy it would be too much. 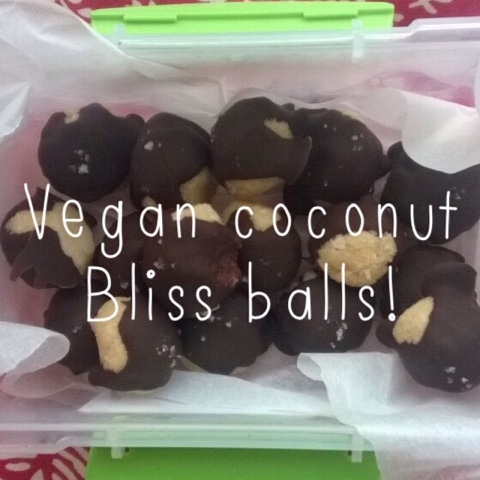 I found that a bar of chocolate was enough for two batches of these, but I guess it's just how you like your balls! 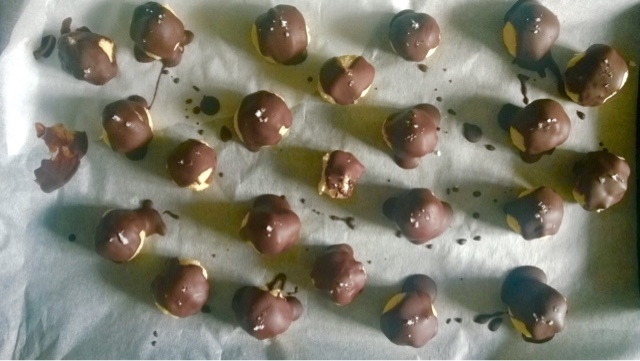 so melt chocolate and then drizzle over balls. just before the chocolate sets sprinkle a little sea salt on the top. yum! pop in the fridge and leave there for a couple of hours. eat with pots of tea and bad tv.